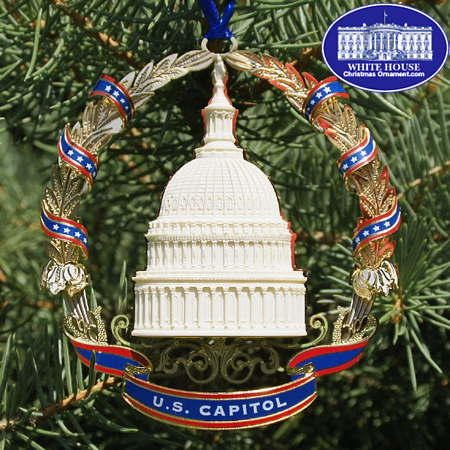 The White House Ornament Collection presents the 2007 US Capitol Marble Dome & Wreath Ornament. The massive cast-iron dome is the Capitol's second dome, replacing an earlier copper -covered wooden dome constructed in the 1820s. This second dome, completed during the Civil War at a cost slightly more than one million dollars and composed of 8,909,200 pounds of cast iron, is a marvel of architectural engineering. The marble used for this ornament was taken from the wing occupied by the House of Representatives. Every member of the House-more than 9,000-has trod the east front steps, originally installed between 1863 and 1865, leaving footprints of history. Having become dangerously worn and uneven, the steps were removed in 1995 and permitted to use a portion of the removed marble, which is crushed to a fine powder and combined with resin, to create this memento.